It has been well cared for and only has just over 100k miles on it. The A/C is not functioning and the driver's side sun visor is broken. Otherwise, it's probably my favorite car of all the ones I've owned. It's reliable, smooth, consistent. It has extra cargo space in lieu of 3rd row seating, which I sometimes wish it were the opposite. We are a family of 5 with 2 teenagers and a 7 yr old in a booster seat. The back seat is a little snug for all three of them, but not too bad. A Durango is an all around good vehicle it has the room people are looking for but it's not too big and not too pricey. My Dodge Durango has been a great truck, it has a lot of room for everyone to sit comfortably and plenty of legroom for the front and back passengers. The back cargo space is big and offers plenty be of room to load stuff and the seats lay down in the back to give you extra room for large cargo. The look of the truck is appealing and the interior also looks good. The only down side of the Durango is that it gets bad gas mileage, but my truck has a V8 so that is probably why. Comfortable, lots of features, bad gas mileage. Reliable, comfortable family car. It has great features, such as leather heated seats, presets for drivers seat, optional third row. The V8 hemi engine packs a lot of power. This car gets terrible gas mileage is though and it has an awful blind spot a the each side of the windshield. I have never experienced such a big blind spot and I need to be very careful when making left turns from a stop sign. I had some close calls as I was getting used to the car. 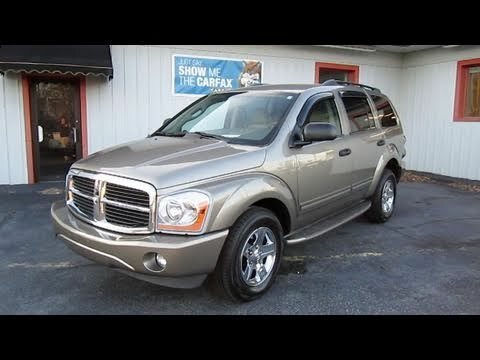 2004 Dodge Durango Review | ultimate family car? Chrysler Group LLC (Chrysler) is recalling certain model year 2004-2007 Dodge Ram 1500 and Durango, 2005-2007 Dodge Ram 2500, Charger, Magnum, Dakota, Chrysler 300, 300C, SRT8, 2006-2007 Dodge Ram 3500 and Mitsubishi Raider, and 2007 Chrysler Aspen. Upon deployment of the driver side frontal air bag, excessive internal pressure may cause the inflator to rupture. Chrysler will notify owners, and dealers will replace the driver side frontal air bag inflator, free of charge. Some of the vehicles included in this recall were recalled under safety recall 14V-354, and that addresses vehicles sold, or currently registered, in Florida, Puerto Rico, Hawaii, and the U.S. Virgin Islands. Owners of those vehiicles were notified earlier in December 2014. Chrysler has not determined a date for notifying the remaining owners of vehicles included in this national recall campaign. Owners may contact Chrysler customer service at 1-800-853-1403. Chrysler's number for this recall is P81. Note: This recall supersedes, in part, safety recall 14V-354 as to the driver's air bag inflators on the vehicles included in this recall. DEALERS WILL INSPECT THE TRANSMISSIONS AND INSTALL A BRACKET TO ENSURE THE PARK PAWL ANCHOR SHAFT IS RETAINED IN THE PROPER POSITION. THE RECALL IS EXPECTED TO BEGIN DURING NOVEMBER 2005. OWNERS SHOULD CONTACT DAIMLERCHRYSLER AT 1-800-853-1403. ON CERTAIN SPORT UTILITY VEHICLES, THE FUEL TANK FILLER TUBE INLET CHECK VALVE MAY NOT FULLY CLOSE AT THE END OF REFUELING. THIS COULD ALLOW SOME FUEL TO ESCAPE FROM THE VEHICLE FILLER NECK. FUEL LEAKAGE IN THE PRESENCE OF AN IGNITION SOURCE CAN RESULT IN A FIRE. DEALERS WILL INSPECT THE INLET CHECK VALVES AND REPLACE THE FUEL TANK ASSEMBLY. THE MANUFACTURER HAS NOT YET PROVIDED AN OWNER NOTIFICATION SCHEDULE. OWNERS SHOULD CONTACT DAIMLERCHRYSLER AT 1-800-853-1403.